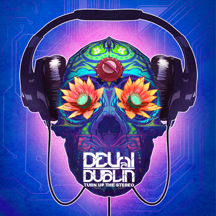 Snob's Music: Delhi 2 Dublin: "Turn Up The Stereo"
Delhi 2 Dublin: "Turn Up The Stereo"
West coast fusion band Delhi 2 Dublin are returning with a new album. The record, Turn Up the Stereo, which is sure to be another collision of Indian, celtic, and pop influences, has been scheduled for an August 28th release. Have a listen to the title track here.